Phyllobates vittatus posing perfectly for Robin Moore´s camera lens at Osa Conservation’s Biological Station. Photo taken from the book In Search of Lost Frogs by Robin Moore. Many of you might be wondering, what makes the Golfo Dulce Frog special so as to have its own project?” Well, there are many fascinating qualities of this species. This beautiful little frog, Phyllobates vittatus, is endemic to the area and is a flagship species to the Osa. It is a unique frog from the genus Phyllobates, and is the cousin of one of the most poisonous frogs, Phyllobates terriblis. Despite how charismatic this species is, it is highly endangered, and no conservation efforts are currently underway. The Golfo Dulce Frog is threatened by habitat loss, water contamination and illegal pet trade. Limited research has been conducted on this endangered species, and a conservation action plan has never been developed, until now. Enhancing scientific knowledge of the species’ ecology. Determining the current and past distribution of the species throughout the Osa in collaboration with citizen scientists. Identifying key areas for habitat protection, habitat restoration, and population translocations. Improving long-term local conservation leadership by raising awareness about the value of this species and building the scientific skills and knowledge of local citizen scientists. 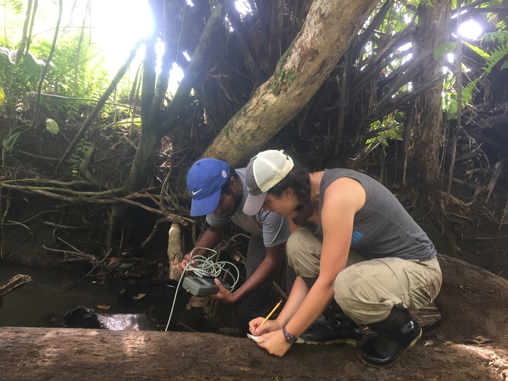 In the first phase of this project, I completed expeditions along the Peninsula, searching for populations of Golfo Dulce Frogs. 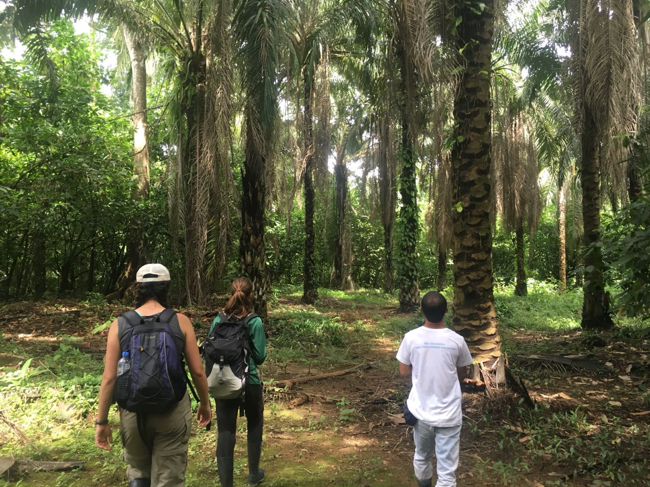 I traveled to different areas of the Osa, visiting partners like Saladero Ecolodge, Los Pargos, and Lapa Ríos Ecolodge. I have also been studying a stable frog population in a known area, checking every morning for individuals and following them for some hours. In this way, I have found some interesting and rather surprising male-male and male-female behaviors and interactions. Female Phyllobates vittatus. Photo by Marina Garrido. The Osa Peninsula marks where the rainforest meets sea, with streams connecting these two valuable ecosystems. The diverse tropical forests of the Osa are not only inhabited by the Golfo Dulce Frog, but many other unique species as well. Therefore, conserving forest and riparian habitats through the protection of the Golfo Dulce Frog will also provide protection for the vast array of species here. 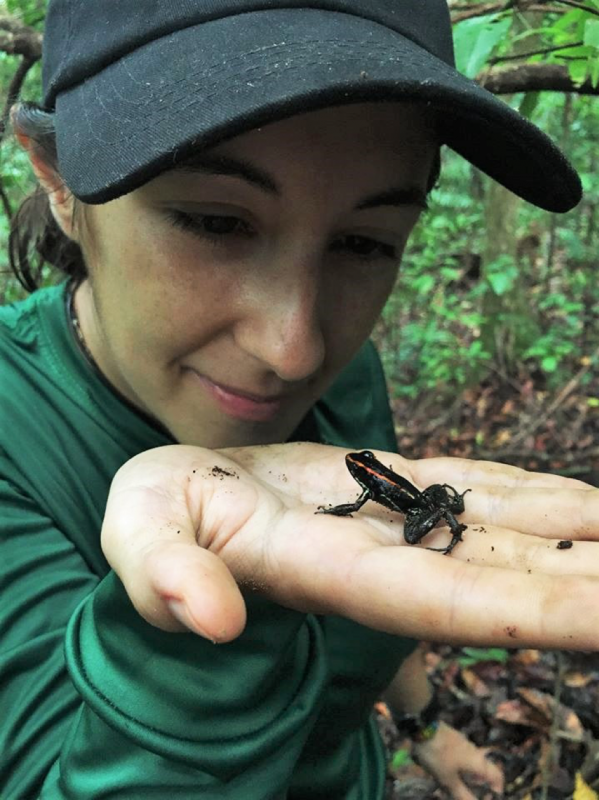 Marina Garrido with Phyllobates vittatus. Photo by Marvin Sánchez. Fortunately, this project is starting to catch people’s attention, and I have been grateful to receive funding from Alongside Wildlife Foundation. 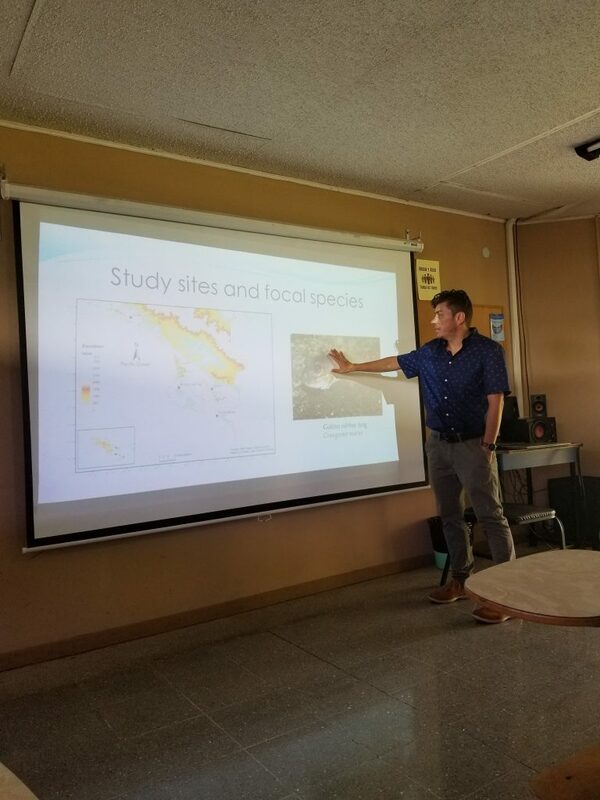 Little by little, it will be possible to create a suitable conservation action plan to protect the Golfo Dulce Frog for generations to come. 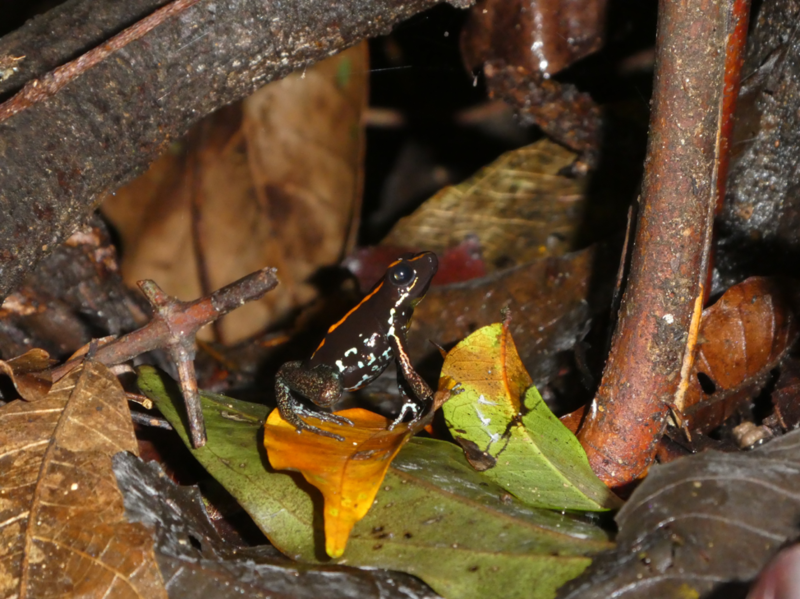 There will be many updates to come as the plan to preserve the Golfo Dulce Frog develops, so be sure to stay tuned to learn more about this beautiful frog, this project, and how you can lend your support! Few things are more fascinating to layperson and scientist alike than animal behavior. For some, this simple fascination can ultimately fuel a lifelong passion for discovering why animals do what they do. Perhaps no better example is the Nobel Prize-winning biologist Karl von Frisch, who, as one of the founding fathers of animal behavior, spent decades studying the social behavior of bees. It may at first seem puzzling how someone could devote such prolonged study to just one critter, but von Frisch explained it quite easily, remarking: “The bee’s life is like a magic well: the more you draw from it, the more it fills with water.” And so too for countless creatures: the more we learn about their behavior, the more new and exciting questions it raises, which keeps us coming back for more. The tropics is an unsurpassed place for such intellectual seeds to flourish. In 2008, I first stepped foot in Osa, just as Osa Conservation was opening its field station. And I’ve been coming back to the Osa nearly every year since, first as a graduate student, then a postdoc, and later a professor, with 2018 now marking a full decade of studies in the Osa (hopefully with many more visits to Osa still to come during the ensuing decades!). Each year I return to the Osa, I fall in love with its amazing wildlife once again. Most of my time is spent studying social animals, ranging from ants to birds to primates. 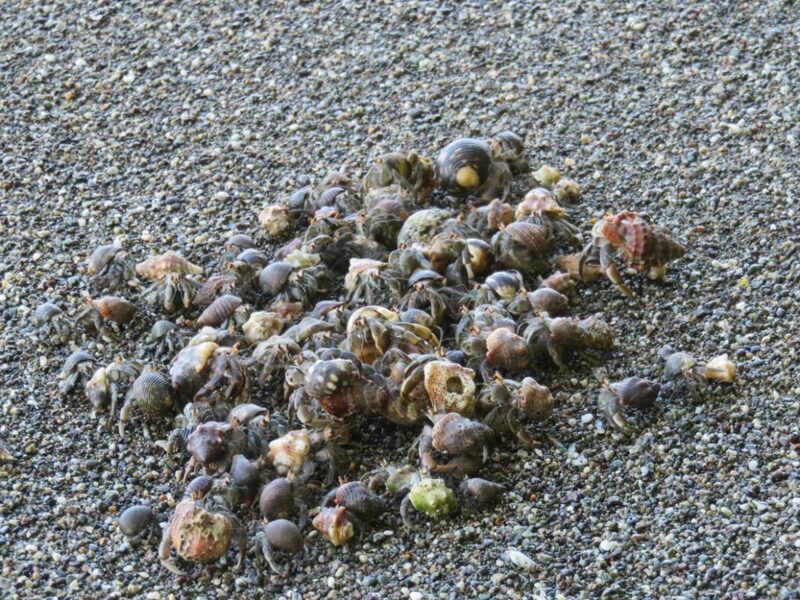 But it is Osa’s most abundant and dominant beach denizens—the terrestrial hermit crabs (Coenobita compressus)—which have been the object of my scientific obsession since 2008. 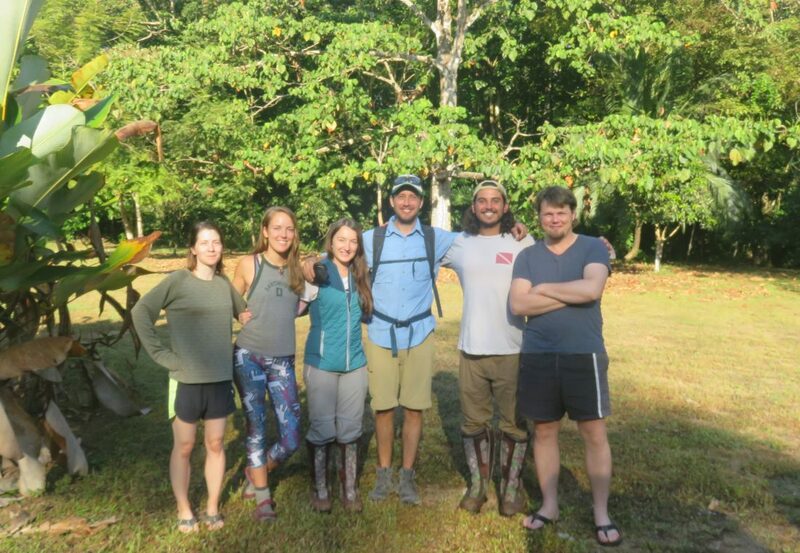 Laidre lab at Osa Conservation’s Biological Station. From left to right: Dr. Louise Roberts (postdoc), Leah Valdes (honors thesis undergrad), Clare Doherty (PhD student), Mark Laidre (PI), Elliott Steele (PhD student), and Dr. Jakob Krieger (visiting scholar). These ‘social hermits’ have an especially complex social life, one which revolves around a housing market of architecturally remodeled homes, passed down across generations as an extra-genetic inheritance. In contrast to social insects (e.g., the bees von Frisch studied), which mostly live among close genetic kin, social hermits live together in what is effectively a vast city of non-kin. Among these unrelated individuals, there is a constant tension between conflict and cooperation, which permeates the very core of their societies. This social drama, combined with these animals’ unusually rich behavioral repertoire and amenability to field experiments, provides a fascinating system reflecting the evolution of social life. Indeed, social hermit crabs never cease to reward curiosity and persistence with further exciting scientific discoveries. Social group of terrestrial hermit crabs (Coenobita compressus) on Osa beach. The many fascinating questions that can be addressed with social hermit crabs reinforces von Frisch’s important point about the ‘magic well’: the magic arises through continued focused study of a particular organism, ultimately enabling deep insights into a topic of fundamental interest. In our humble opinion, the best recipe for science is therefore simply letting an inherent pleasure in discovering new things about nature drive ever deeper exploration of one’s favorite magic well. And Osa is perhaps the most magical well one can imagine for discovering new things about nature. Hope we’ll bump into you there during our next field season. My name is Hector Zumbado-Ulate and I’m one of the awardees of Osa Conservation’s Alvaro Ugalde Scholarship. Currently, I am pursuing a PhD in ecology and evolutionary biology at Purdue University. Since I started my studies in biology, I felt very attached to amphibian conservation projects, especially those helping species which are currently endangered by anthropogenic causes. For that reason, I wanted to work with the critically endangered Golfito robber frog. Specifically, I want to examine why this species persists in remnant populations after going extinct in much of their historical home range. 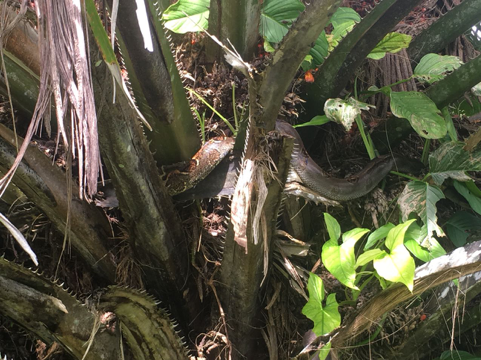 Such information is valuable to develop adequate conservation policies that can be implemented to protect these populations and encourage their expansion back into their historical habitat range throughout Costa Rica. 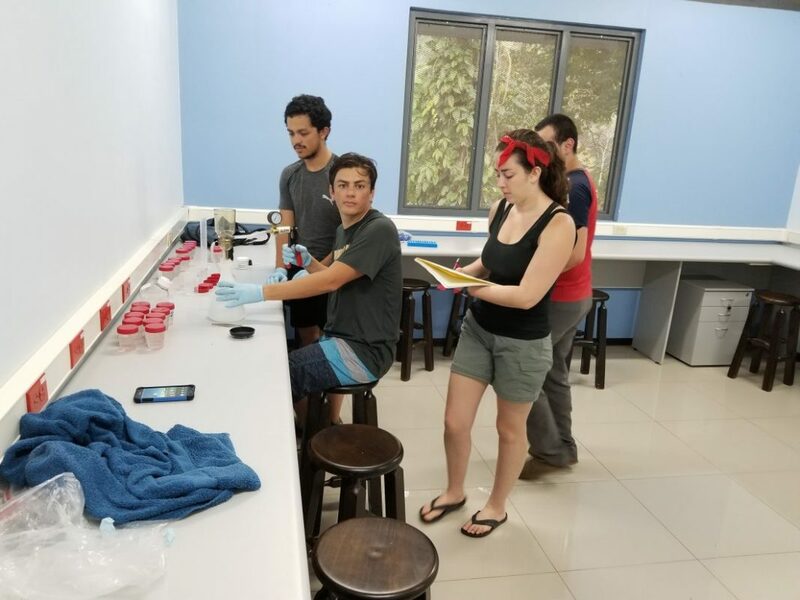 In particular, I am studying host-parasite interactions between endangered frog populations and the fungal parasite Batrachochytrium dendrobatidis (Bd), which causes chytridiomycosis, a potentially deadly disease that threatens many amphibian communities. At least 90% of the 34 species of robber frogs have catastrophically declined or have become completely extinct since the 1980s, likely due to this taxa’s high susceptibility to this disease. 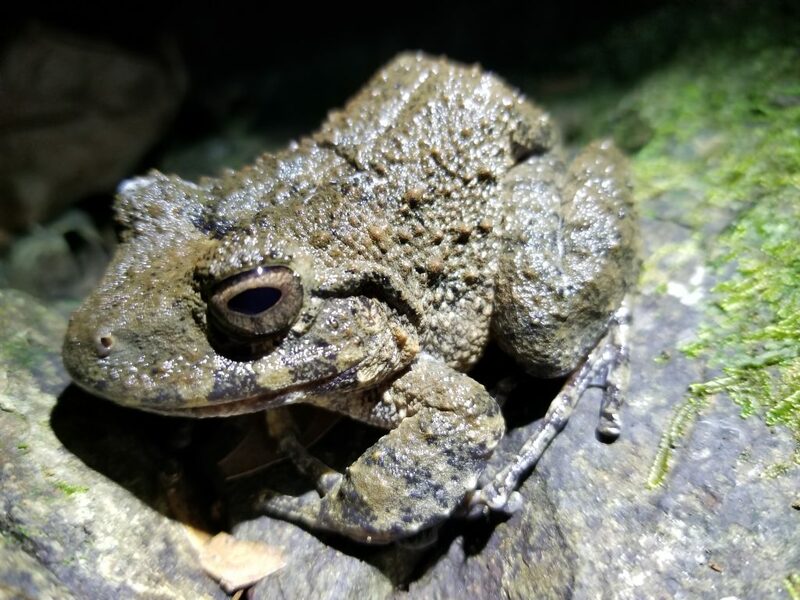 I am also quantifying how environmental stress caused by climate change affects reproduction, population dynamics, and susceptibility to chytridiomycosis in remnant populations of critically endangered robber frogs. The critically endangered Golfito robber frog (Craugastor taurus) in Punta Banco, Golfito. 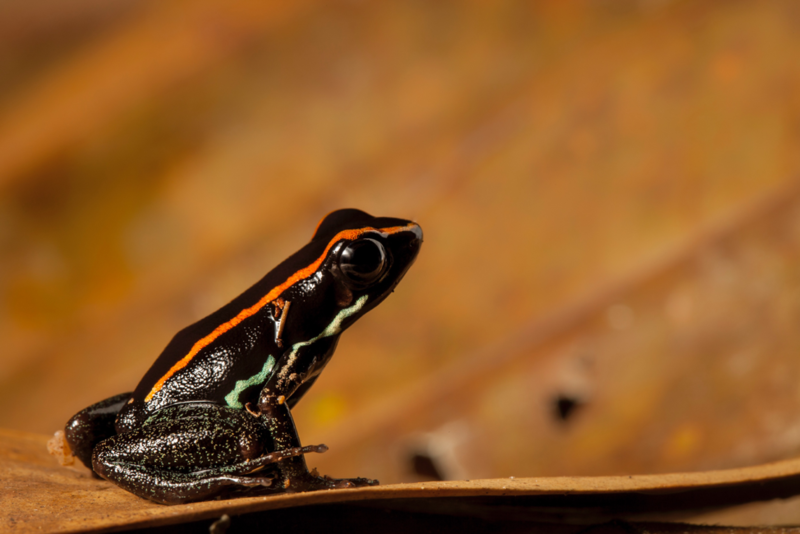 In the last decade, some populations of the Golfito robber frog have been rediscovered in the peripheral areas of their historic home range. This suggests that 1) peripheral populations may have survived environmental threats that affected core populations, 2) the slow recovery has made these declined species almost undetectable across their range, and 3) there might be more cases of remnant populations that still thrive but remain undetected. Remarkably, rediscovered remnant robber frog populations coexist with B. dendrobatidis without experiencing chytridiomycosis and the proposed project aims to identify the mechanisms that allow these susceptible frog species to coexist with this lethal parasite. 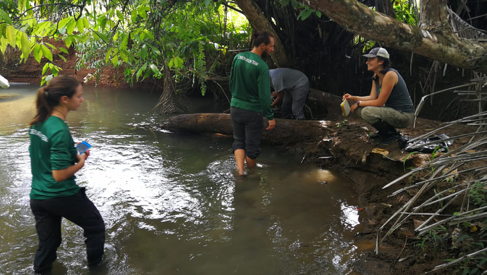 With the help of volunteer field assistants, I am conducting habitat monitoring and parasite detection to evaluate the risk of extinction of remnant populations three times every dry season. 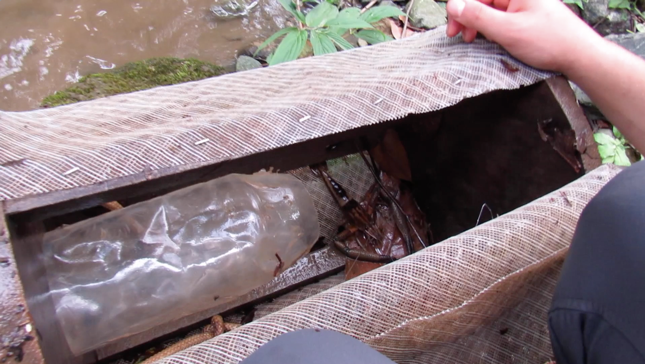 Specifically, I am sampling fast-flowing stream networks in Punta Banco, which are the only known streams that sustain stable populations of the Golfito robber frog. 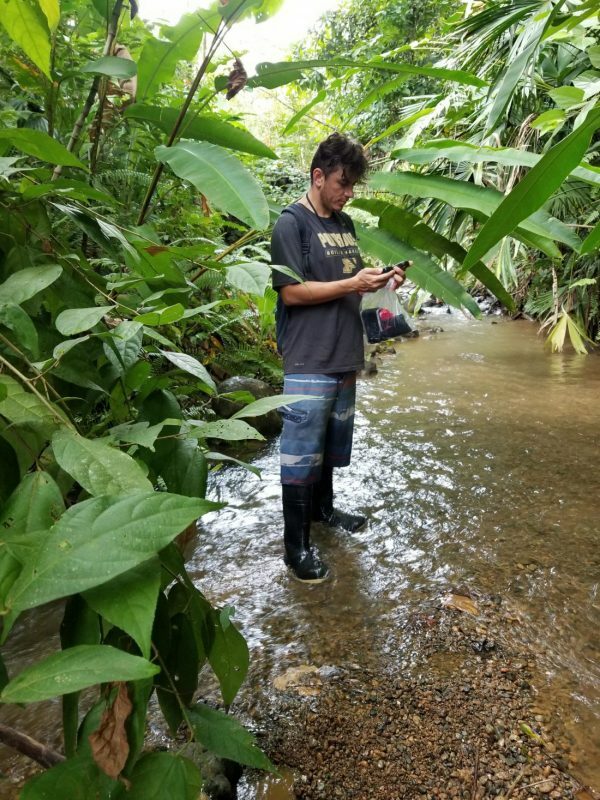 I am also monitoring and continuously looking for the Golfito robber frog in streams in the localities of Uvita, Golfito, and Rincon de Osa (this latter location historical represents the most abundant populations of the Golfito robber frog before its decline during the 1980s and 1990s). In every stream, we are conducting multiple linear transects. 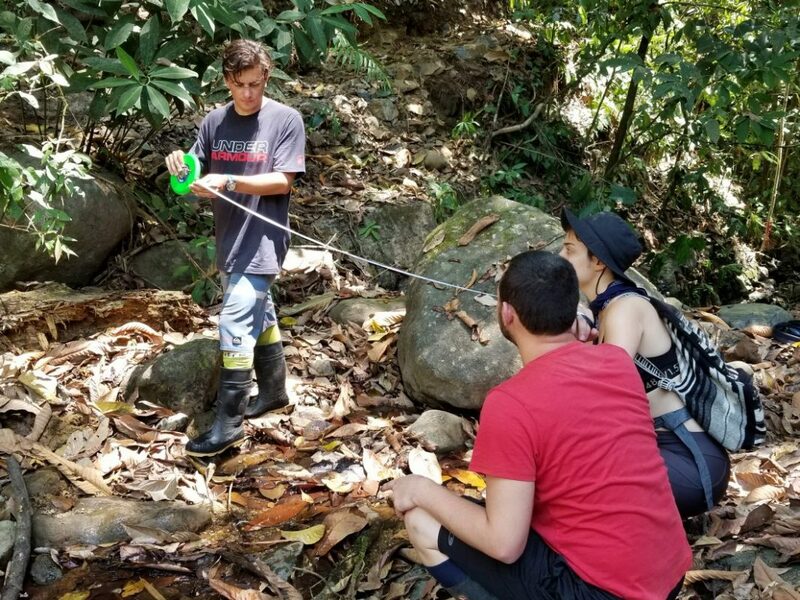 On every trip to the field, we characterize every transect by measuring several environmental variables such as air temperature, humidity, stream width and depth, and canopy cover, among others. We catch individuals of all occurring frog species and measure the snout-vent-length and body mass. We also swab the frog’s skin to collect Bd zoospores. Moreover, we analyze water samples to determine if the concentration of Bd zoospores varies across stream location. Filtering of water samples from Quebrada Agua Buena in Rincon de Osa, with the aim of detecting Bd zoospores. Propose and implement in-situ strategies to increase the survival of adult frogs and recruitment of juveniles in remnant populations. Expand the range of declined robber frogs across their original home range. Establish a long-term monitoring project in collaboration with volunteer local groups, students, and professionals. Invited speaker at Universidad de Costa Rica, recinto de Paraiso in June, 2018. Here I presented this project to ecotourism students.